Part of the fun of the holiday season is not only the delicious edible treats, but the excuse to decorate and make a fuss over little details. And that absolutely includes fancy food touches like decorated cookies and, in this case, a pull-apart bread shaped like a Christmas tree. 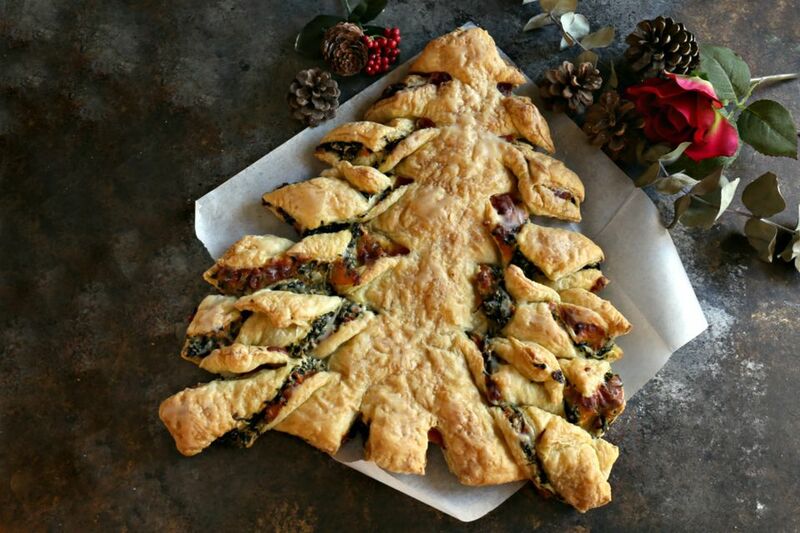 The combination of spinach and cheese is a classic and often combined with feta and phyllo dough. This recipe pairs it with shredded mozzarella for an extra melty pull-apart loaf that guests won't be able to resist. And while this festive treat looks extremely complicated, it actually relies on ready-made puff pastry and just a few simple steps. Your guests will think you worked on this for hours and you don't have to tell them otherwise. The hardest part about this bread is not eating it all before the company arrives. Add the olive oil and onions to a skillet or cast iron pan. Saute on medium heat until the onions become translucent. Add the garlic and continue sauteing for an additional minute. Stir the chopped spinach into the mixture and stir to combine. Remove from the heat. Stir in the cream cheese, Parmesan, salt, and pepper. On a large piece of floured parchment paper, roll out one sheet of the thawed puff pastry to about a 12-inch length. Using a straight edge, like a ruler, cut the center into a large triangle. This will give you the one large triangle in the center and two smaller ones on the side. Press the two remaining sides into the edges of the large triangle to make it wider. Spread the cooled spinach mixture over the large triangle and top with the mozzarella cheese. Roll the second sheet of puff pastry on a well-floured surface until it's about 12 inches long and place on top of the cheese layer. You will need to stretch it out to fit over the first base triangle and cut off any excess pieces until you have one large filled triangle. Using a pizza cutter or sharp knife and a ruler as a guide, cut slices from the middle to each edge, approximately every 1 or 1 1/2 inches to form the tree branches. Be sure to leave about an inch unsliced in the center so that the tree has a solid trunk in the center. Using your hands, take each slice or "branch" and twist it once, twice, or three times depending on how long it is. The short branches at the top will have one twist, the middle will have two twists, and the bottom of the tree will have three twists. Carefully transfer the parchment paper with the completed tree to a baking sheet and bake for approximately 20 minutes or until the top is a light golden brown and the cheese has melted.